WooHoo! It's Friday and it's been a BIG week at Taylored Expressions. Last Friday marked our biggest release to date with five new stamp sets, 2 new Key Ingredients kits and over 20 other new products in the store. I hope you've had a chance to check it all out and do some shopping! Then on Monday Taylor announced her upcoming move to Iowa where she'll be able to focus on TE full-time! Of course today is Cupcake Friday and time for another awesome TECC sketch from Taylor. As if all that weren't enough, today is Taylor's birthday! Like I said, BIG week at TE! We've found a wonderful *Our Friday Friend* to help us celebrate this week - please welcome Julie Smith (hobbywoman on SCS). 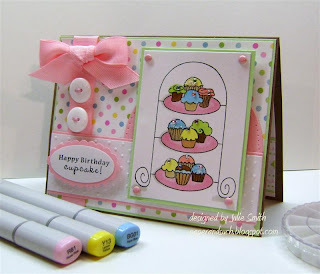 This CAS card in her gallery caught our attention and this week she sampled the TECC72 sketch along with the Cupcake Crew so we could share with you here on the SASI Blog. Julie features For the Love of Cupcakes on today's card (click on it to see it larger.) For details you can hop over to her blog Paper and Such, but first let's get to know a little bit about Julie. I live in New Oxford, PA....which is a small town about 10 miles east of Gettysburg, PA. I've been in this area for about 20 years now, but home will always be Buffalo Mills, PA. Which is a VERY small town about 1-1/2 hrs east of Pittsburgh. I was one of those girls that walked up hill both ways in 4 ft of snow!! I've been addicted to papercrafts for many years. I've tried my hand at all kinds of hobbies, but I have always been drawn back to stamping. I used to scrapbook, and my life goal is to sometime finish my two sons' scrapbooks. I've been stamping for probably about 15 years on and off, but seriously stamping for about the last 4 years. Although I did my first challenge card on SCS about 3 years ago, and its been a slippery slope ever since. I find myself waking up in the middle of the night thinking about stamping! Sometimes I even get out of bed and make cards very early in the morning! I think my style is clean and simple.....kinda crisp too, with a little of this and a little of that thrown in there. I think my style changes from day to day, depending on what stamps/companies I'm using, and who I'm making the card for. I honestly enjoy making cards. I don't always have time to spend on different projects, so cards are easy for me. Its like instant gratification! Just one?? Thats a tough one, but I really like the cuppie in bed from the Doctors Orders set. He's so sweet and he's being a good boy while he's getting his temp taken. Plus he's reading a book (which is another hobby of mine). Well, since I'm a diabetic on an insulin pump, I probably shouldn't answer this, but oh what the heck....I'm a real sucker for a chocolate cake with peanut butter icing. A co-worker of mine makes the best one I've ever tasted! Thank you Julie for being Our Friday Friend! How about you? Would you like to be Our Friday Friend? Want play the Taylored Expressions Cupcake Challenge (sketch #72) along with us this week? Just hop over to Taylor's blog to see the sketch and get all the details! Congrats Julie!! I'm so proud of you girl. Love the card it's gorgeous! What a beautiful card Julie! I LOVE the bow with the buttons and the sentiment in the oval. It's gorgeous! LOVE your card Julie! The ribbon and 2 buttons are PERFECTION!! Jami, great choice of Julie -not only a very talented stamper, but a VERY sweet person!! Perfect for Taylor's b-day card!! This card is FABULOUS! Congrats to Julie ~ I'm a fan of her amazing creations! Congratulations, Juli. What a perfect card - everything about it is just right! congratulations, Julie! what a sweet card!! Congratulations, Julie! When I got the email from Jami letting us know who was the Friday Friend this week, I was all excited...like, "Hey! I know her!" Great card for today's post and I liked reading your interview. Best of luck with your upcoming move!